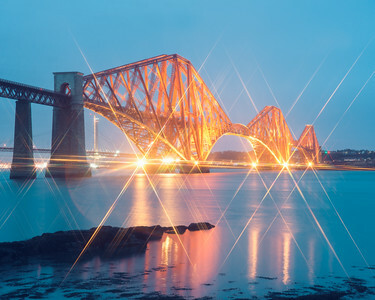 This is a 25 second exposure of a floodlit Forth Bridge, taken in December 2014. 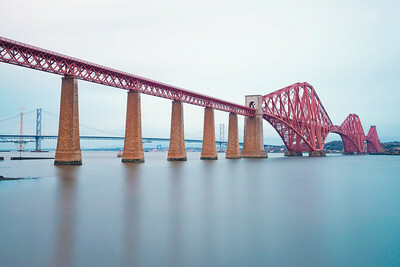 I take the time to shoot the bridge almost every time i travel to Scotland; it always seems to look a little different. The tide was in for this shot, which makes such flat calm long exposures every more possible. 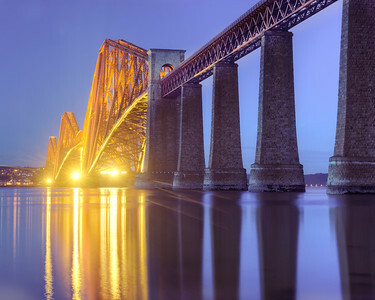 A 20 second exposure of the Forth Bridge, taken during dusk (just after sundown) on a winter's December evening in 2014 from South Queensferry. This is the infamous Forth Road Bridge. 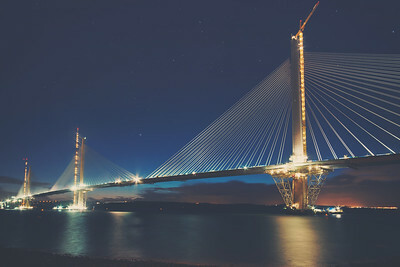 Infamous due to it's ongoing structural deficiencies and maintenances issues, which eventually took such a toll that a new bridge (The Queensferry Crossing) can be seen growing in the background, December 2014. 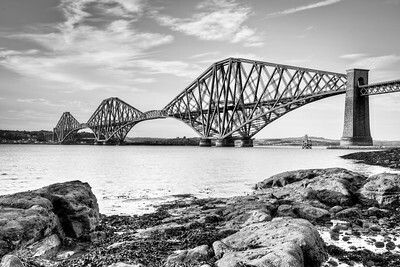 Black and White images of the Forth Bridge look so much better with the tide in - it promotes a more minimalist feel to the shot. 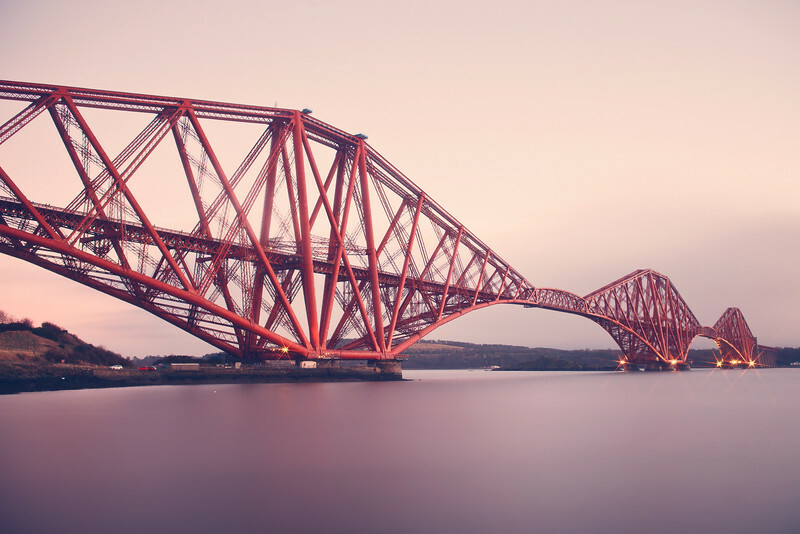 I had such an opportunity when I visited South Queensferry in December 2015. Scotland. 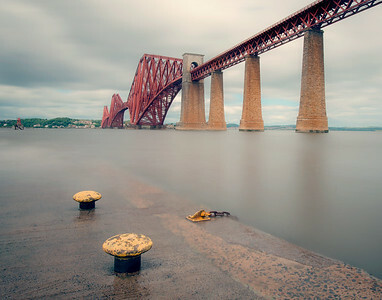 The Forth Bridge has suffered from a number of structural problems for many years now. 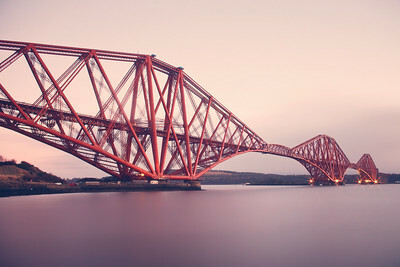 An elegant looking bridge, but it's days as the principal connector between Fife and Lothian are numbered. The Queensferry Crossing will open in 2017 to replace it. This shot was taken in May 2012, when the new crossing was just a twinkle in Holyrood's eye. 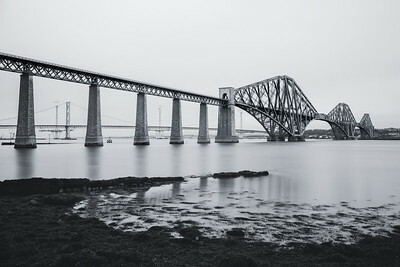 I haven't taken many shots of the Forth Bridge from the North Queensferry side of the estuary, but it was interesting to explore options (in the rain) in December 2016. This is a slightly unconventional composition, taken from the end of a very slipper pier. In the last throws of construction, this is the new Queensferry Crossing, taken on a rainy night from North Queensferry, Scotland, 2016. 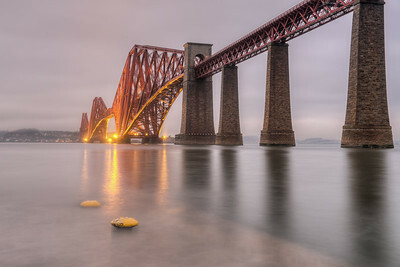 I've seen other people's images showing the mist shining in this distinctive v-shape on the south the of the Forth Bridge, but i'd never seen it myself until i took a trip through to shoot the bridge in the rain in December 2016. 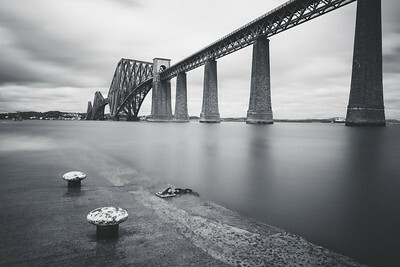 Taken from near the end of Hawes Pier during a mid-tide condition, this is the Forth Bridge, South Queensferry, 2017. f/9, 1/500s exposure. I like the tight troop on this image, accentuating the detail in this genuinely historic structure. 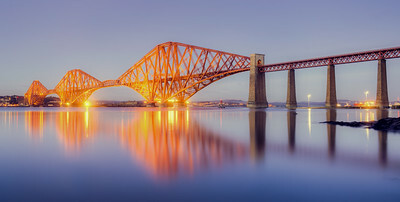 Another 10 stop filter image of the Forth Bridge. The long exposure and the constructing colours make this a prime target for monochrome conversion. I tend to find minimalist images best for black and white. Scotland, 2017. 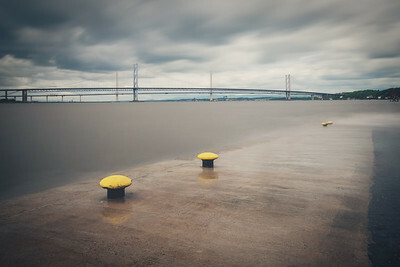 An image that will soon stabilize and become a fixture on the horizon, now that the distant Queensferry Crossing is nearing completion. Scotland, 2017. 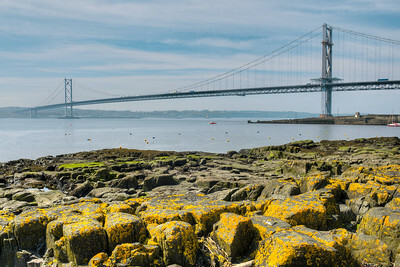 First time i had taken the time to wander around this part of North Queensferry, in Fife, Scotland. 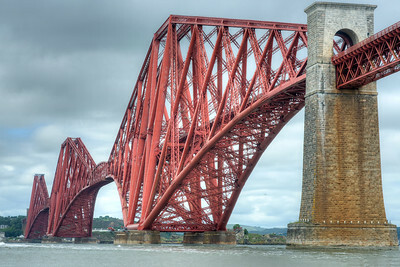 It does provide an interesting vantage point for this panorama of the Forth Bridge, however. 2017. Some of the items in the image could've been placed a little better, from a photography perspective. Still, it's an interesting foreground for this image of the Forth Bridge, taken from North Queensferry, Scotland, 2017. 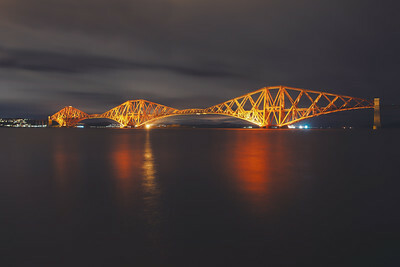 I've gone to take photos of the Forth Bridge late in the evening many times, but it continually tests my patience as I wait with bated breath on the flood lights coming on - never know quite how long after sunset it takes. This is just after lighting in December 2017. 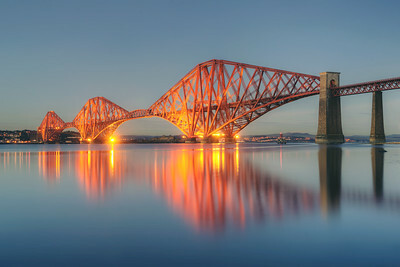 Panoramas of the Forth Bridges are becoming more common now that that there are three of these magnificent structures. This is not a stitched image, though - rather it is a 3:1 crop, using a long exposure image. Scotland, 2017. 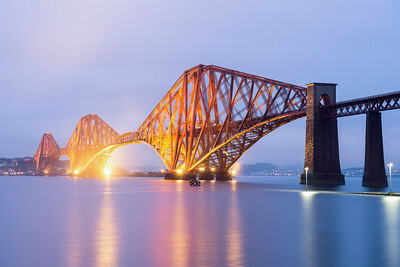 This is a thirty second long exposure (f/11) of the Forth Bridge. 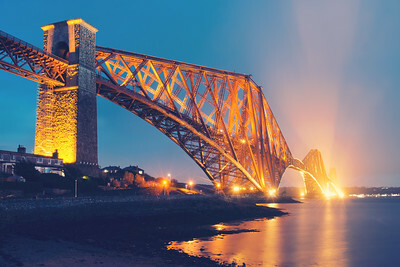 The lights and the colour of the bridge make it a perfect candidate for blue hour photography. Scotland, 2017. 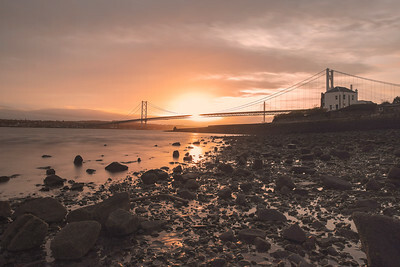 The sun sets over the Forth Road Bridge and the Queensferry Crossing, taking during a rising tide from North Queensferry. 2018. 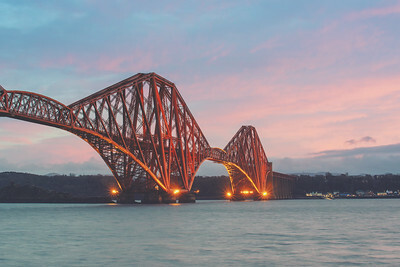 A 30 second long exposure of the Forth Bridge from North Queensferry, as a pink sky tried hard to make it's way east along the Forth Estuary. Scotland, 2018. 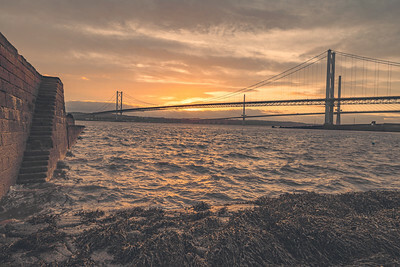 Choppy waves on the Firth of Forth as the sunset sets on the old Forth Road Bridge and the new Queensferry Crossing. Scotland, 2018. 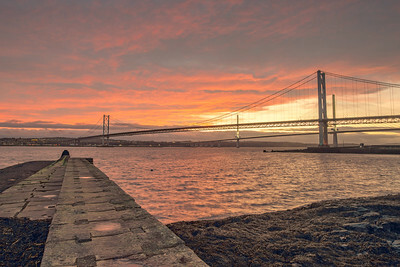 A glorious pink sky over the Forth Road Bridge and the newer Queensferry Crossing. 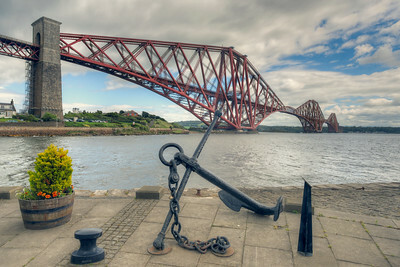 Taken from the pier at North Queensferry. Scotland. 2018. 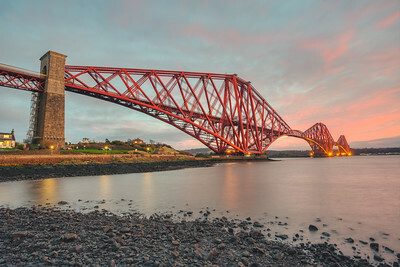 A 60mm prime shot of the huge structures that comprise the Forth Bridge, looking magnificent in the sunset with the lights just starting to illuminate the the massive girders. 2018. A 30 second exposure of the Forth Bridge under the night sky; taken from the marina at South Queensferry. Scotland. 2018. 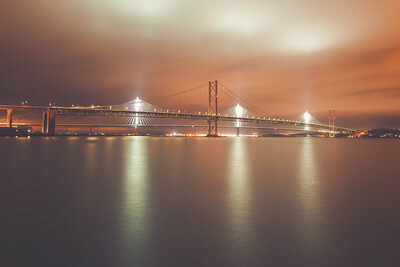 The Forth Road Bridge and its replacement, the Queensferry Crossing, under a cloudy night sky on the Firth of Forth, Scotland, 2018.